The effect of collection time on essential oil of Oliveria decumbens Vent. Eftekhari*, M., Shams Ardekani, M., Khanavi, M., Amini, M. (2017). The effect of collection time on essential oil of Oliveria decumbens Vent.. Research Journal of Pharmacognosy, 4(Supplement), 89-89. M. Eftekhari*; M.R. Shams Ardekani; M. Khanavi; M. Amini. "The effect of collection time on essential oil of Oliveria decumbens Vent.". Research Journal of Pharmacognosy, 4, Supplement, 2017, 89-89. Eftekhari*, M., Shams Ardekani, M., Khanavi, M., Amini, M. (2017). 'The effect of collection time on essential oil of Oliveria decumbens Vent. 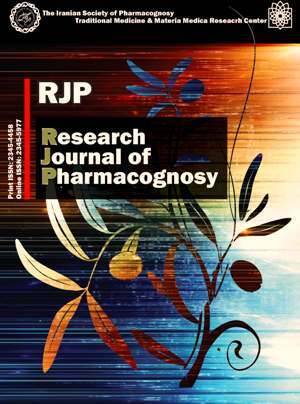 ', Research Journal of Pharmacognosy, 4(Supplement), pp. 89-89. Eftekhari*, M., Shams Ardekani, M., Khanavi, M., Amini, M. The effect of collection time on essential oil of Oliveria decumbens Vent.. Research Journal of Pharmacognosy, 2017; 4(Supplement): 89-89. 1Department of Pharmacognosy, Faculty of Pharmacy and Persian Medicine and Pharmacy Research Center, Tehran University of Medical Sciences, Tehran, Iran. 2Department of Pharmacognosy, Faculty of Pharmacy and Persian Medicine and Pharmacy Research Center, Tehran University of Medical Sciences, Tehran, Iran. Faculty of Land and Food Systems, University of British Columbia, Vancouver, BC, Canada. Background and objectives: Oliveria decumbens belongs to Apiaceae family and is used in wide range of diseases such as gastrointestinal disorder. Several studies have shown that Oliveria decumbens essential oil possessed high amount of thymol and carvacrol but some other studies revealed that myristicin was one of the main components of the oil. The aim of the present study was investigation of the lunar phases effect on chemical composition and yield of the essential oil. Methods: Oliveria decumbens aerial parts were collected in three times based on the lunar phases (new moon, full moon and waning crescent) from the southwest of Iran. The essential oils of all three phases were obtained using hydrodistillation and analyzed by gas chromatography-mass spectrometry. Results: Our results showed that the plant was collected in the full moon phase indicated the highest yielded of the oil (4%), whereas the new moon showed the lowest yield (1.2%). Moreover, this investigation revealed that, the lunar phases significantly affected the main components of the oils. The full moon essential oil had high proportions of thymol and carvacrol (totally: 75.09%) and waning crescent volatile oil showed the lowest proportion (56.92%). It is noticeable that myristicin was in the highest amounts in waning crescent (15.32%) while being the lowest in the new moon phase (2.01%). Conclusion: According to the results, difference of the three essential oils may be due to the difference of the lunar phases. Complementary studies on the plant essential oil in the lunar phases are in progress.